I have questions for you, Spiriteds. One, do you have a slow cooker? Two, do you have access to water? Three, do you have frozen chicken breasts? Lastly, do you have access to pepper and some form of a leafy green? 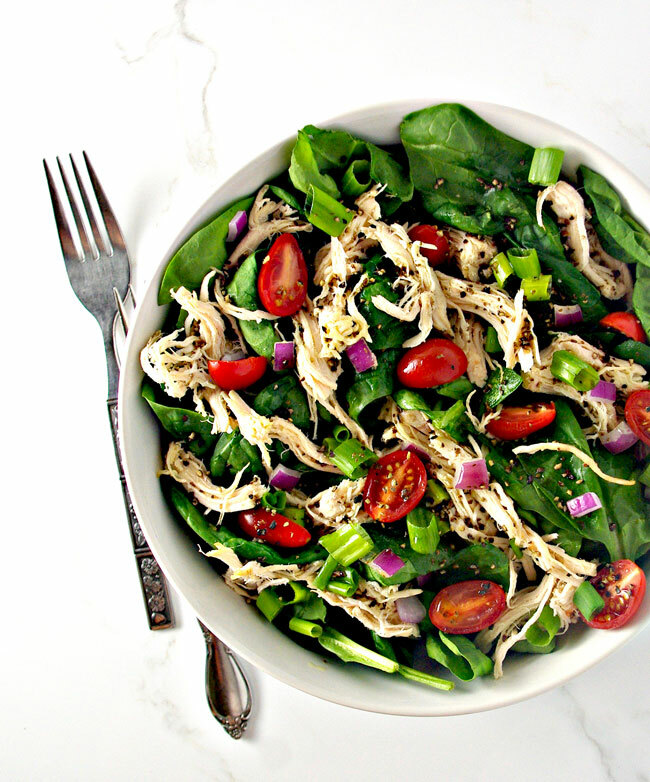 If you answered yes to at least the first three questions, you have the leg work done for Slow-Cooker Peppered Chicken Salad. Essentially, this recipe is my new favorite way to prepare chicken for any meal. Seriously, this is a throw-it-all-together kind of recipe. No precious directions that make or break the outcome. It’s low maintenance and flexible and versatile. 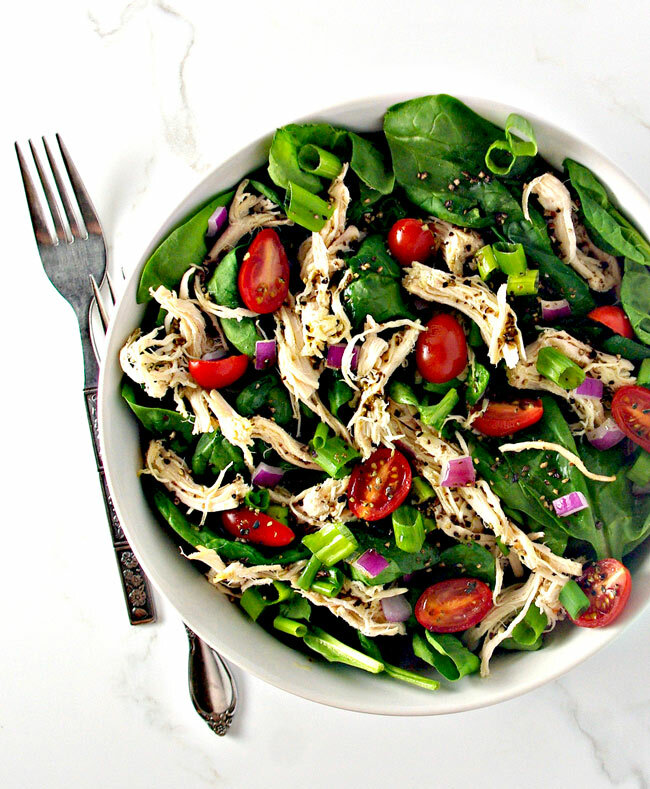 Slow-Cooker Peppered Chicken Salad knows we lead busy lives, and it wants to make things easier on us. So why not let it? I mean, even the chicken breasts don’t have to be pre-thawed. Literally just throw them in the slow cooker with enough water to submerge them and simmer for six to eight hours. Okay, that’s it. That’s the recipe. If I literally shared nothing else, you’d be in good stead with this. But, I’ll elaborate a little more. For example, I have cooked thinner and thicker chicken breasts using this recipe, and the taste was delightful no matter what. However, I found the thicker chicken breasts, with rib meat included, provided a larger yield closer to the three large/six regular portion sizes listed in the recipe below. I also like to add a little olive oil to the water, if I think of it, along with the eponymous black pepper, sea salt, garlic and onion salts (of course), and for this photoshoot, celery seed. You can, however, choose whatever seasonings you like. 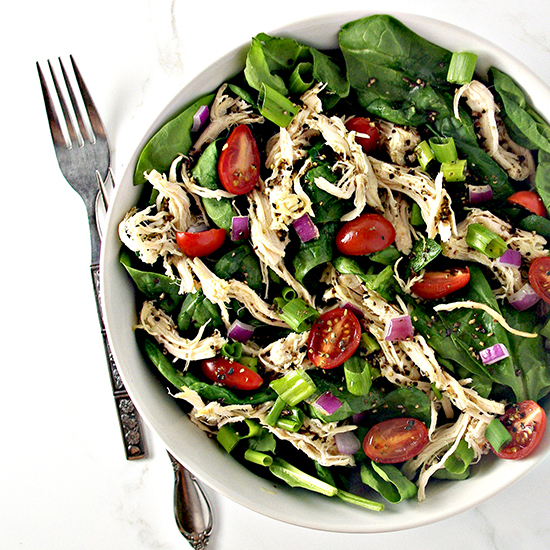 After the chicken is done, I shred it using two forks in a criss-cross fashion and serve it over a bed of butterhead lettuce or spinach. The chicken is juicy, tender, and absolutely mouthwatering. Then I top the salad with red and green onions, tomatoes, and a light olive oil dressing. Lemon Celery Seed Dressing (pictured) and Homemade Italian Salad Dressing are two of my favorites. I have yet to try it with Raspberry Vinaigrette Dressing with this, but that’s on my bucket list for sure. As a side note, K-Hubs is partial to the latter mixed with tuna, so there you go. As for the water, it turns into a beautiful amber broth, which although not a true bone broth (a la Homemade Bone Broth), K-Hubs and I decided should be kept and used in other recipes. 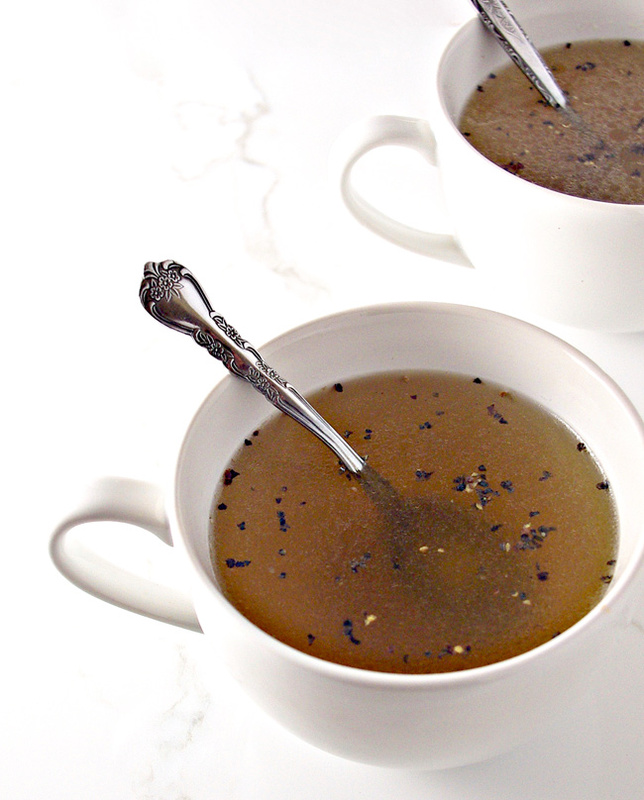 In fact, I almost didn’t share this recipe with you because I couldn’t decide what to do with the broth. However, I plan to revisit this recipe once the weather cools and turn it into a soup or stew. It’s just too delicious and comforting to pass up. In the meantime, we’ve been throwing vegetables in the broth and savoring the flavor. 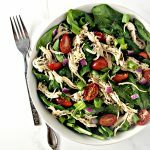 Slow-Cooker Peppered Chicken Salad is perfect for busy schedules, as I discovered, because if I want it for lunch, I set the slow cooker just before bed. And when I wake up in the morning, I pull the chicken out and let it cool while I get ready. Depending on your schedule, you can assemble the salad right then in a mason jar, as K-Hubs is wont to do before he heads to work, or refrigerate it for later. I like to keep the chicken stored in the broth if I’m not serving/assembling it right away. If you want a dinner-ready salad waiting for you when you get home from work, then set the slow cooker before leaving and assemble when you get home. It’s as simple as that. And if you’re deciding between setting the slow cooker for six hours or eight, I’ll tell you what I do. I set it for six and take advantage of the two-hour warming feature. It’s also entirely possible I did that one night, happily overslept the next morning, and finally got around to it well after eight hours of cooking. The chicken salad still tasted amazing and no one died. THAT is winning. 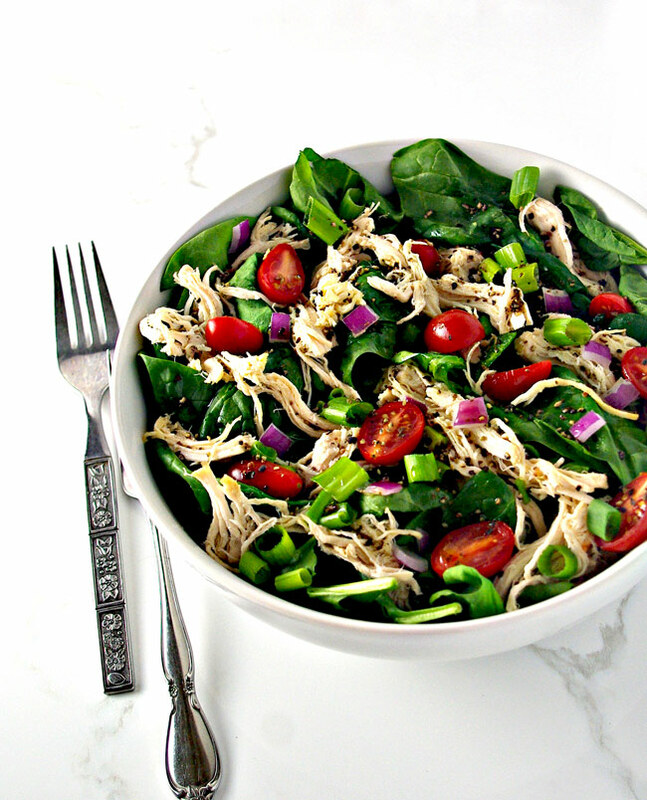 So is not having to do much to prepare a meal, and Slow-Cooker Peppered Chicken Salad gets that. 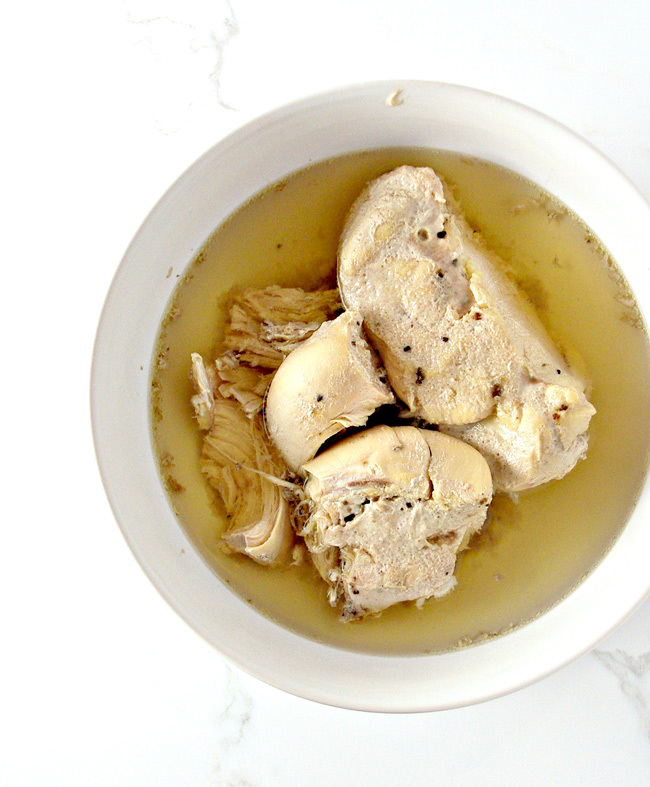 Place frozen chicken breasts in slow cooker and submerge with tap water and optional olive oil. Pour in pepper, celery seed, onion salt, garlic salt, and sea salt. Simmer for 6 hours and warm for an additional two hours, if desired. Remove chicken breasts from slow cooker and, using two forks in a criss-cross fashion, pull the chicken apart. Serve over lettuce and top with onions, tomatoes, and desired dressing. Use chicken within three days. I like to make individual servings for my salad. So I use about 2 cups spinach or lettuce with a few tablespoons each of red onion and green onion. I’m a freak for tomatoes, so I like to pour a bunch on each salad I make!